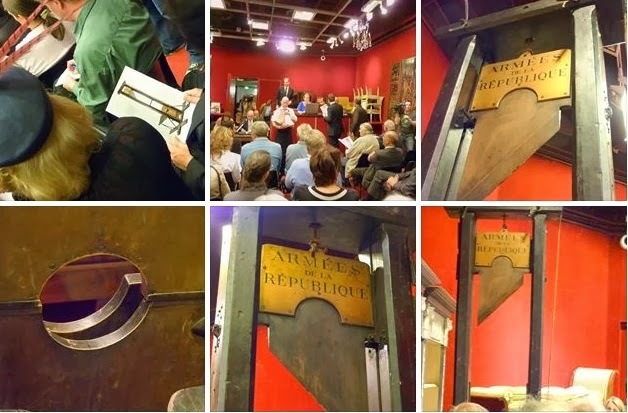 Until recently the last guillotine in Paris could be found on view in an unlikely location - a jazz club/bar called Le Caveau des Oubliettes (“the dungeon cellar”) at 52, rue Galande in the Latin Quarter. 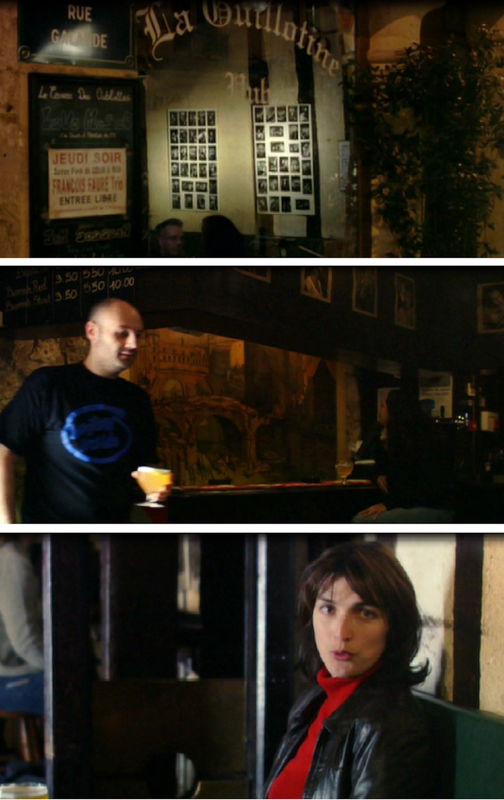 Downstairs, where the guillotine was housed, the bar is formed from the remains of a cell from the Petit-Châtelet, the medieval fort protecting the Île de la Cité from the south. 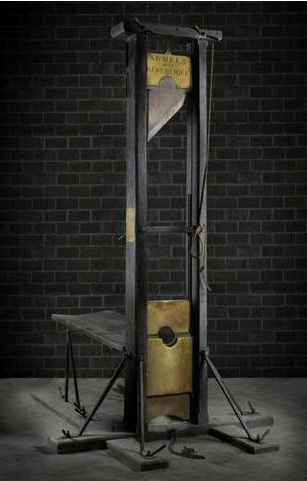 There are loads of internet posts reporting the existence of the guillotine but its provenance is much less well-known. Sandrine Voillet's BBC TV programme, Paris: an insider's view (2007) solves some of the mystery, identifying it as a "portable guillotine" from Lyon. In her programme the proprietor confirms that the guillotined was bought in Lyon in 1920 and dates from 1793. It was used by the Republican Army against the Royalists; it packs up to be carried and it weights 37lbs. Perhaps the bar has fallen on hard times for the guillotine was sold at auction on 15 June 2011. 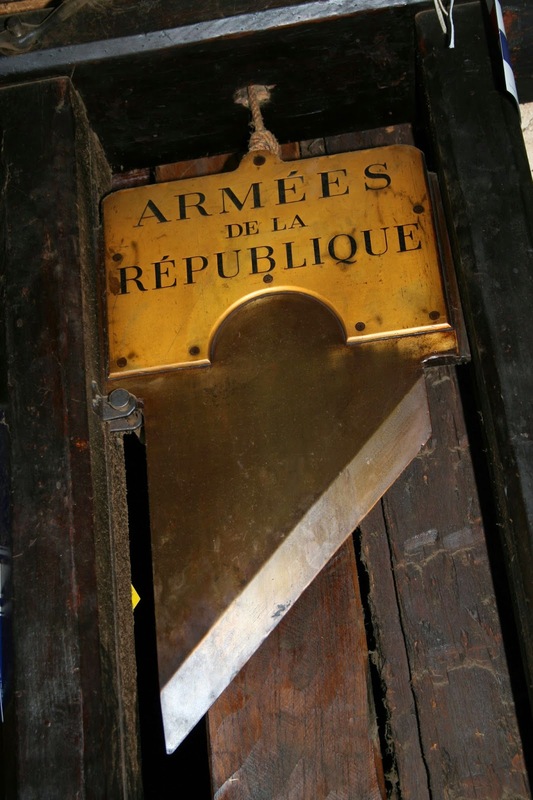 The notice identifies it only as one of several "1792 model" guillotines which travelled with Carnot's Armées de la revolution and says simply that it was bought by the great grandfather of the present owner in the Lyon region. The sale was worthwhile - this macabre relic fetched 195,000 Euros!. 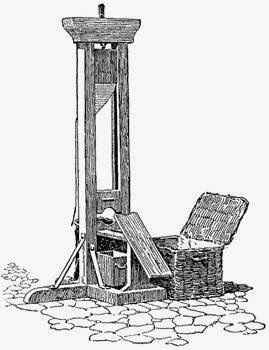 By summer 1793 use of the guillotine had been threatened in Lyon in for some time. It was a particularly theatrical proposal of the local Jacobin leader Joseph Chalier - who rivalled Marat in his bloodcurdling oratory - that one should be erected on the narrow Morand bridge over the Rhone, so that heads would fall into the river on one side, and bodies on the other. His intention, he announced to an enthusiastic crowd, was "to purge the town of aristocratic vermin by cutting off fifty heads." A guillotine was duly dispatched from Paris in a box and set up in the place des Terreaux, behind the Town Hall, with a ring of soldiers to guard it. It was supposed to warn those who conspired against the "patriots" of the fate they might expect. Ironically, following the taking of the Town Hall by federalist forces on 28-29 May, it was Chalier himself who was to be its first victim. The execution took place on 16 July. It was a memorable fiasco. "The official executioner in Lyons was called Ripet, and he came from a family which had held the post as a hereditary fief for generations. He was a jocular individual who had a teasing relationship with his assistant, Bernard, whom he called "Mon commis" (My errand boy), whilst Bernard called him "Mon Bourgeois". Despite Chalier's threats, the guillotine had never been used before, and Ripet and Bernard were uncertain how to use it. Furthermore, the crowd who came to witness the elimination of the man who had kept them sleepless at night swarmed over the platform of this unfamiliar instrument to examine it, and unbalanced it. In the late afternoon, Chalier, surrounded by troops, walked from the Prison de Roanne, which was where the Palais de Justice now is. With watery eyes fixed on the sky, seeing the reincarnation of a martyr who had denounced "heretics" too fiercely, he mounted the scaffold. Ripet and Bernard seized him, bound him to the plank, tilted him down, placed the top of the "window" over his neck, and released the blade. Notices of the sale of the Lyon guillotine in 2011. There are surviving examples in museums in Venlo (Netherlands), Liège, Bruges and Luxembourg. Was this the same one I wonder?